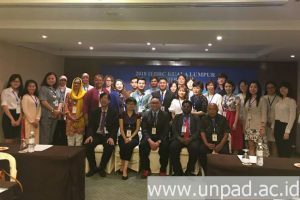 [unpad.ac.id, 11/7/2018] History Students of the Faculty of Cultural Sciences (FIB) of Universitas Padjadjaran, Anas Anwar Nasirin represented Unpad in 2018 4th International Conference on Culture, Languages, and Literature (ICCLL 2018) held by International Economics Development and Research Center (IEDRC), on 26-28 July 2018 in Kuala Lumpur, Malaysia. Anas’s participation in ICCLL on the paper he wrote with his supervisor Taufik Ampera entitled “Wheel of Hope as Media Creates Hope Become Reality and Becomes a Parameters Success in Realizing Dreams: A Case Study at Darul Inayah Cisarua Orphanage Bandung Regency”. The research will be published in the International Journal of Culture and History (IJCH). In the event, Anas made a presentation with the theme “Language and Culture” along with a number of other participants from various universities in the world, namely from Midwestern State University of USA, Tsinghua University of China, Sookmyung Women’s University Korea, and Gadjah Mada University, Indonesia. “It is a valuable learning opportunity, because I am here yet to be anyone in terms of degree and science so I have more spirit,” said Anas in a release received by Unpad PR. The paper written by Anas and Taufik discusses the tool of hope in the form of Wheel of Hope. Wheel of Hope is a sheet of paper containing a target goal achievement column for a certain period of time. Wheel of Hope has been simulated to 34 respondents of the 17-18 year age range at Darul Inayah Cisarua Orphanage, West Bandung Regency from October 2017 to May 2018. The simulation results show measurements of three successful expectations of each respondent: Success Education (SP) want to be fluent in English and read 2 books in one month, hope Success Meets Desire (SMK) among others, hope to walk with family and want to buy clothes, and hope Successful Education and Success Meets Desire (SPSMK) in the form of SP + . Of the three categories of successful expectations, 91% of respondents have realized their success expectations by applying the Wheel of Hope. Based on the parameters of long-term success in 2030, there are two categories of successful expectation, namely Family Success (SK) such as the desire to build a house for the family and leave the family to perform the pilgrimage, and hope Success Society (SM) is the hope of success on the desire to build free schools, orphanages, and become a philanthropist. “So if based on the simulation result, Wheel of Hope was able to make hope becomes reality as well as there was possibility to become parameter of success in realizing their big dreams in the future,” said Anas.